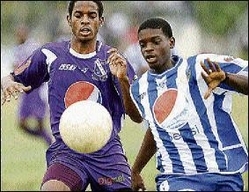 Norman Manley High secured their place in the next round of the Manning Cup and also booked their Walker Cup spot when they turned backed Kingston College (KC) 2-0 in their ISSA/ Pepsi/Digicel match yesterday at the Tinson Pen playing field. It was a very physical encounter from the start with both teams jostling for midfield dominance. The best attempt on goal in the first half came in the sixth minute when the best player in the first half, Norman Manley's Dean Phillips, cracked a free kick from 20 yards which struck the upright and rebounded into play. The second half saw both teams being more direct, with KC stringing together some good passes. They, however, relinquished their dominance of the game when Noel Mais was shown his second yellow card in the 55th minute and sent off. Norman Manley capitalised on their numerical advantage almost immediately when KC captain, Rasheed Malcolm, was placed under pressure by Norman Manley's substitute Lashawn Watson and in an effort to clear a cross he turned the ball into his own net. Whatever hopes KC had of salvaging a point were dashed a minute later when Norman Manley's Andre Berry, who had been on the field for only 10 minutes, scored with a well-placed shot. Ardenne 5 St Jago 3. Group F: Charlie Smith 2 Kingston Tech 0; Eltham 2 Ascot 1.